This entry was posted in Art, Gratitude and tagged creativity, holstee manifesto, inspiration, typography by Becky Green Aaronson. Bookmark the permalink. I have not came across something like this before. Great post Becky. Thank you for this one. You are welcome. 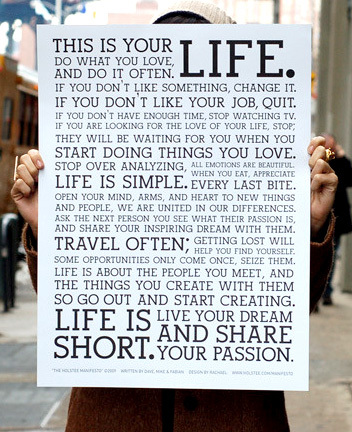 This manifesto always inspires me so I thought it was worth posting for others to enjoy. Hadn’t seen this. It’s great. I’m glad I posted it then. It always makes me smile and reminds myself to chase after what’s important in life. Yes, always good reminders. Thanks Becky.